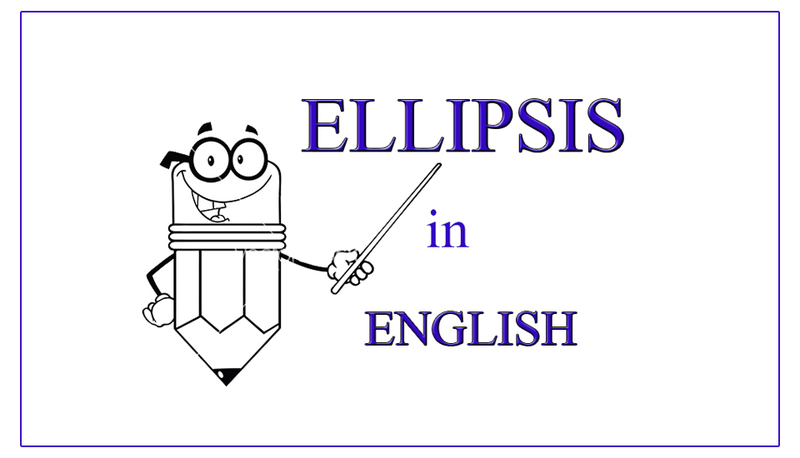 What is ellipsis? Do you use it in your conversation and writing? Read the whole article to know when to use ellipsis. We often leave out words to avoid repetition or in other case when meaning can be understood without unnecessarily repetitive words in a sentence, is called ellipsis. Indeed ellipsis is very common, especially in informal conversation and in writing. In this article you will learn what an ellipsis is and how to use ellipsis in your writing and speaking. When we leave out items in speaking which we would normally expect to use in a sentence, but meaning can be understood without them. Check out the hints below when to leave out items in speaking. In replies we usually avoid repeating information that has just been given. Answer. At 06:00 pm (Not I will come at 06:00 pm). Repeated words are often dropped in coordinating structures. A plate and glass (Not a plate and a glass). She is poor but honest (Not she is poor but she is honest). In informal speech unstressed words are often dropped at the beginning of a sentence, if the meaning is clear. Seen lucky (You seen lucky). Does not know what to do? Auxiliary verbs are often used alone instead of a full verb. Ali: I have not paid fee. We can use “to” instead of repeating the whole infinitive. Are you and Ms. Maryam getting marriage? Answer. We hope to. (We hope to get marriage). We can leave out words after “as” and “than”, if the meaning is clear and understood. The weather is not as good as last year. (Meaning: the weather is not as good as it was last year). I earn more money than you. (Meaning: I earn more money than you earn). A repeated noun can sometimes be dropped after an adjective if the meaning is clearly understood. Answer. Boiled please. (Meaning: I would like boiled potatoes). A: What are you looking for? B: [A] Pen. Can you see one anywhere? [The] Postman’s just been. There’s a letter for you. What is ellipsis in writing? In writing, an ellipsis is (…) three dots used to show an omission of word or words (including whole sentences) from a text. We use it in our writing to create a pause or to show an unfinished thought. In the second example above the part of the sentence seems unnecessarily repetitive, and taking it out doesn’t change the meaning, instead you can use … ellipsis, but be sure you don’t change the meaning. Stories and novels use ellipses to a very different effect. An ellipsis can demonstrate a pause in dialogue, a pause in narrative, or a character or a narrator trailing off. Note: The format of these ellipses is typically to add a space between each dot, and remember an ellipsis consist of exactly three dots called ellipses points. A pause in the text appears much the same way. She was angry . . . she was just tired. This case uses an ellipsis similar to what would be used in a piece of news writing, but it is understood that the character who is speaking is merely pausing for emphasis or thought. No words were omitted from his or her dialogue.